While I was working as a social worker on an inpatient psychiatric unit, I became disillusioned and shocked at the extremely high rate of readmissions by patients. Even though the typical length of stay lasted less than a week, it seemed as though I was caring for the patients on a long-term basis. Whenever they returned, we picked up where we had left off since they were last discharged. I learned if they followed through with the previous recommendations made by the psychiatrist, nurse, and myself. The recommendations included taking their prescribed medications, attending structured therapeutic groups, attending appointments with their psychotherapists, psychiatrists, nurse practitioners, and rehabilitative outreach workers. Sometimes they were expected to access government benefits, such as food and shelter, by completing applications. I often encouraged patients to use their state-funded Department of Mental Health (DMH) rehabilitative outreach workers as much as possible. These workers were expected to help their clients access housing (e.g., 24-hour supervised group residential programs), vocational services, transportation, and outpatient treatment providers. And I listed these services whenever I recommended DMH and offered applications to patients. Really? Disillusionment sets in again. If they don’t help with housing, then what does DMH help with? Without supportive and supervised housing, seriously mentally ill people will inevitably have difficulty taking care of themselves, leading to further hospitalizations. Instructing your clients to go elsewhere for help with housing is not acceptable. DMH is supposed to care for and protect the most severely ill. Yet, they’ve fallen short. 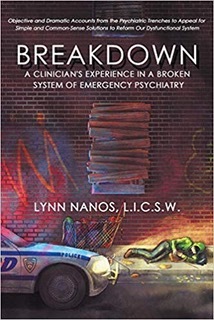 I wrote the book, Breakdown: A Clinician’s Experience in a Broken System of Emergency Psychiatry, to expose the injustices that I’ve seen in the field. Breakdown closely exposes barriers to patients getting the help that they need. The shortage of inpatient beds, increased rates of criminalization, overly restrictive involuntary hold criteria, premature inpatient discharges, and insufficient means to ensure that patients adhere to their outpatient treatment plans make for a broken system. Consequently, too many patients end up homeless, jailed, harming themselves, harming others, or even dead. My book educates the public about the plight of those who need the most help. Increased awareness of a problem tends to inspire change. My greatest hope is that my book motivates people to advocate for legislative improvements of the system. Please tell your legislators about Breakdown and give it to them.